A young college graduate in 2009, Duan Biqing(段必清) became leader of a small poverty-stricken village in Yunnan Province. Overwhelmed by the poverty problem in the village, he decided to start a chicken cooperative and help farmers learn the best techniques(技术) to raise(养殖) free-range chickens. ow, over 170 households(农户) have increased(增加) their income(收入) to more than six times that of the poverty line, making an average(平均) of 9,000 yuan more per year of income per household than they made previously. He has taught 8,000 villagers advanced chicken breeding techniques. To honor Duan's achievement, he has been granted National Award for Poverty Reduction- the only one this year from Yunnan Province. The farm now produces some 90,000 native cage-free chickens(散养鸡) and 700,000 eggs with annual sales of 8 million yuan. 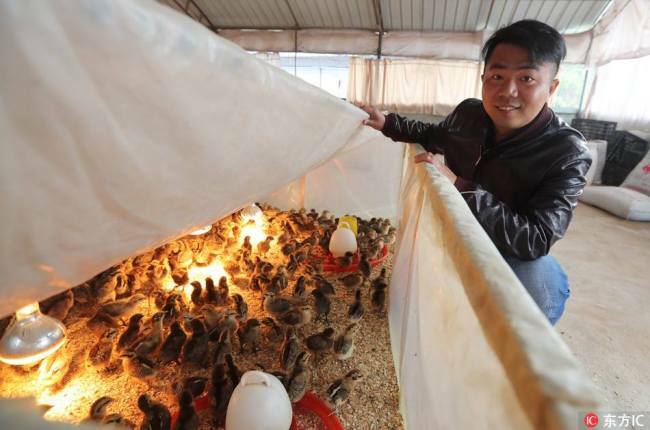 Duan has held more than 300 training workshops to help more than 8,000 villagers learn about most advanced(先进的) chicken breeding techniques(养殖技术). The farm's major customers(客户) are from Beijing, Jiangsu and Guangdong. To honor Duan's achievement(成就), he has been granted the only National Award for Poverty Reduction in Yunnan Province. The doctor asked the patient to strip off. The patient is not yet out of danger. 回家时间到啦！Time to go back home! “全中国最小的山”火了 Is it a rock or a mountain?